The Limpsfield Village Store has been owned and run by the local Community since 1999. It was bought on behalf of the village following a campaign which was initiated when it became clear that the village might lose its only food-store and local Post Office. Go to their web-site for comprehensive information about food and services and opening times. No more information will be published here. 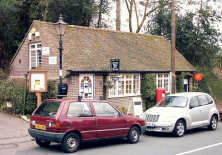 In 1998 the Memorial Stores and Post Office, which had been part of Limpsfield Village for many years, was in danger of closing. Local people wanted to continue to have a local shop and PO and decided to save it. Over £40,000 was raised through gifts and loans to buy and relaunch the business for the benefit of the local community. The business reopened in April 1999 and has fulfilled everyone's dream by becoming an Important part of the Village. The shop employs three staff. The shop and PO are managed by Jane Radziejewski. David Humber is our early morning star and Abby Barras is in charge on Sunday mornings. In addition there is a large number of volunteers who give an hour or two a week to help in the shop (some do much more!). You will meet them providing good service on the checkout when you shop. One volunteer has been trained to be able to work in the Post Office. Over 240 local people hold a £10 share in the Limpsfield Village Store Association Ltd. This is a 'not for profit' organisation which owns the business. A Management Committee of seven people oversees the operation of the business. Help as a volunteer, training provided. Just ask Jane.